Scale greater heights and be a sensation with learning to focus! Do you know the unstoppable power of learning to focus with meditation and rescheduling? Do you know that nothing can be accomplished in life without successfully learning to focus on your passions? Do not waste time writing down questions and relying on focus groups and depth interviews. It is time to rise high and discover your likes and dislikes to achieve your only target in life - success. Be it sports, studies, relationships, careers, health or time management, the key to empower your spirit is learning how to focus on your goal. There are myriad questions in our minds regarding ways to focus on your assignment but answers are few, and the most indispensable answer is -Focus. Our delineated e-book- Learn to Focus - Key to Be a Frontrunner in Life!!! will guide you to the path of conversion and will help you shed inhibitions which have been troubling you since years. There is nothing that is impossible for an individual, provided there is sufficient hard work and pain that is invested in a task. Our well defined e-book is all-inclusive, written in simple English and easy to read and decipher. The readers will benefit immensely from the practical tips given in our e-book which will help you to form a straightforward target in life and will lend a hand so that you utilize all your time and energy into conquering it. The difference between those who are triumphant and those who fall short of success is that a winner focuses exclusively on the bull's eye, like a sniper who is taught-'one bullet, one kill'. After reading this well-outlined e-book you will know the significance of learning to focus and self assurance to be a victor in life. Your success is certain with quick focus and by blocking all negative thoughts and uplifting constructive thoughts. Several counselors, mentors, therapists and psychologists are out there to offer guidance and assistance to you for cleansing mental cordon and physical reluctance. This e-book does the same for you! Many of us suffer from an inferiority complex that we are far behind others and the trail to success is hard-hitting. The truth is that, we often compare our failures with our counterparts and always forget the little successes we taste in life. Why can't we rely on our strengths and endeavor to improve the weaknesses within us? 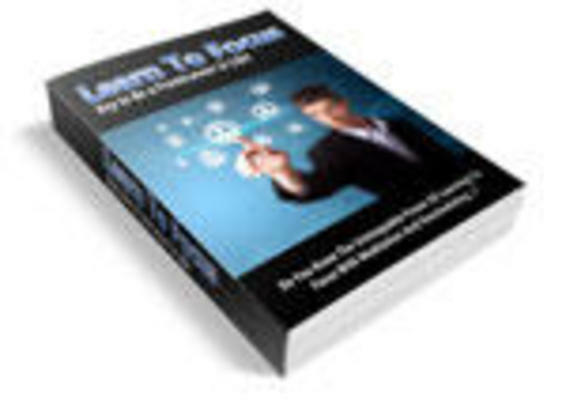 Our well-explained e-book- Learn to Focus - Key to Be a Frontrunner in Life!!! contains impartial inputs given by experts and therapists who have written soul-stirring and mind uplifting books before. This has enabled us to incorporate optimistic approaches suggested by therapists to people who have been disappointed with life or who find it thorny to concentrate on their chores. Who says you can't focus to improve relationships without seeing a counselor? And how will you learn to focus on the latest, most cutting edge marketing strategy for your business? All of these, and more only in this idiosyncratic e-book which is pleasant to read and very enlightening for all age groups. Rage Relief - With Mrr.